Pragpur, a small village near Dehra subdivison of Kangra distt. 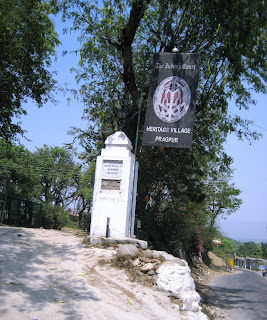 of Himachal Pradesh is India’s only officially declared heritage hamlet. Pragpur is located in the lush green Kangra valley in Himachal Pradesh surrounded by snow covered Dhauladhar mountain range. Pragpur was declared as the country’s first “Heritage Village” in December 1997, credit for which goes to villagers who have preserved their rich history and heritage with such a dedication and determination. The buildings are preserved by 'Gram panchayat' and they also notify new constructions taking place in the village. A number of heritage buildings have been or are being restored by adding modern facilities in them to make a comfortable stay for tourists. Pragpur village still have cobbled stone streets, mud-plastered walls and slate-roofed houses. The name Pragpur is made up of two Hindi words; Prag and Pur. Prag means ‘pollen’ in Sanskrit and pur means ‘full of’, so Prag-pur means ‘full of pollen’. Pragpur was founded in the late 16th century by the Kuthiala Soods in memory of Princess ‘Prag Dei’ of the Jaswan Royal family. Sood community has dominated the Prgapur region for decades. Pragpur is a perfect site for village tourism in India. Not only you got to see the magnificent ancient glory so well preserved but also the nature at its best in the lap of Himalayas. Judges court was built in 1918 for Justice Sir Jai Lal, the second Indian to become a Judge of the Punjab High Court. Judges court is a classic mix of Indo-European design. Justice Sir Jai Lal's descendants now run it as a hotel. Judges court is the heritage hotel spread in 12 acres of land and is full of greenery and plantation. You can find more information about Judges court or about room booking at http://www.judgescourt.com/. Other tourist places in Pragpur are Taal(village pond), Kaleshwar Temple, Lala Rerumal Haveli-it has Mughal style garden, pleasure terrace and a large water reservoir, Dada Siba temple, Butail Mandir, Chaujjar Mansion, Courtyards of the Sood Clans, an ancient Shakti Mandir. You can also visit Dharamshala and Mecleodganj (60 Kms. from Paragpur), Kangra(45 Kms. from Paragpur), Masroor rock cut temple(55Kms. from Pragpur), Chamunda Devi, Palampur and Jawalimukhi temple. If you are after a refreshing and peaceful vacation, Pragpur the home of the famous Kangra school of painting can be one of the considerations. A visit to Pragpur will be a delightful & refreshing experince for you. Heritage Village Pragpur is just 6 Kilometers from Nehran Pukhar(about 10 Kms. from Dehra on Kangra-Chandigarh Highway) on Nehran Pukhar- Amb link road.